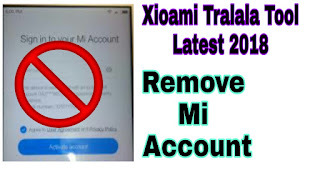 Xioami Tralala Tool Latest 2018 | you can remove mi account by this tool easily and by one click . simply download and open the tool and choose mode which phone you want to remove mi account than just click on unlock micloud the tool will remove your phone's mi account lock and you can download the firmwares of many mi models by this tool with one click . You can Downlaod firmware of same models of mi given up with one click.